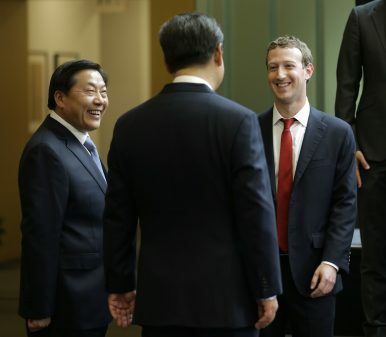 In this Sept. 23, 2015, file photo, Chinese President Xi Jinping, center, talks with Facebook Chief Executive Mark Zuckerberg, right, as Lu Wei, left, China's Internet czar, looks on during a gathering of CEOs and other executives at Microsoft's main campus in Redmond, Wash.
China’s former internet czar accepted the judgment in court and said he would not appeal. On March 26, Chinese state news agency Xinhua announced that Lu Wei, China’s former internet czar, was sentenced to 14 years in prison for accepting bribes and fined 3 million renminbi (about $ 447,000) by the Intermediate People’s Court of Ningbo in Zhejiang province. Lu Wei — who was listed as one of Time magazine’s 100 most influential people in the world in 2015, but accused as a “shameless,” “extremely disloyal,” “double-faced man” by China’s top authorities in 2018 — reportedly accepted the judgement in court and said he would not appeal. As The Diplomat has been closely following, Lu, 59, began his career as a reporter. Starting in 1991, he worked for Xinhua, where he was gradually promoted to the agency’s senior leader. In 2011, he was elevated to the position of vice mayor of Beijing city, in charge of the propaganda department. In 2014, China established the Office of the Central Leading Group for Cyberspace Affairs, or the Cyberspace Administration of China (CAC). Lu was appointed as the first director of the office. The CAC functions both as a government organ and a Party organ; this made Lu extremely powerful over China’s internet industry. He was thus called China’s internet czar. As a sign of his influence, most U.S. internet industry leaders, including Apple chief executive Tim Cook and Facebook founder Mark Zuckerberg, at some point conducted high-profile meetings with Lu, in an attempt to charm the Chinese government. The court held that the amount of bribes Lu received was extremely large. But considering that Lu had “actively confessed his crimes, expressed repentance, and returned most of the money and property,” the court decided to sentence Lu to a relatively lenient sentence: 14 years in prison. Other high-profile fallen politicians, such as Zhou Yongkang and Bo Xilai, have been sentenced to life in prison for corruption. Additionally, the court has confiscated all the money and property — including any interest arising from them — that Lu obtained through his corruption.